Organizations all over the world are shifting their IT resources to the cloud. For many of those organizations, choosing a cloud identity management platform like Google Cloud Identity is the first step. 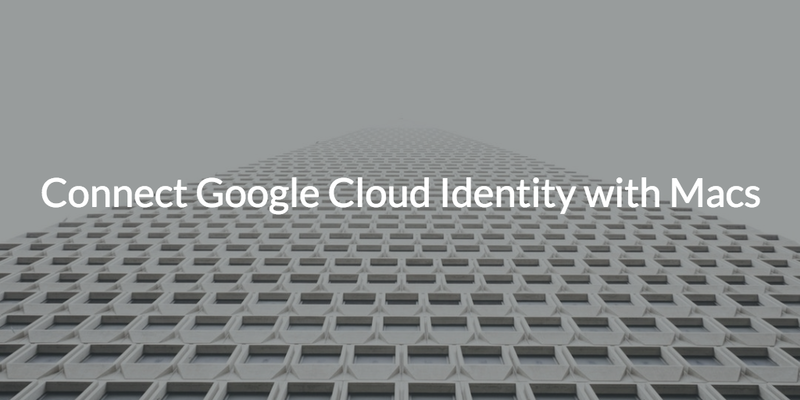 Google Cloud Identity offers a number of advantages as an identity provider (IdP) for Google’s various services. Unfortunately, these advantages only apply to Google services. That doesn’t include the ability to connect Google Cloud Identity with Macs. Macs have become the preferred option in many modern organizations. They can offer numerous advantages, and it’s not uncommon for Mac shops to leverage Google as an alternative to Microsoft solutions, specifically G Suite instead of Office 365. As a result, the question for a lot of organizations leveraging Google as their IdP is how to connect Google Cloud Identity with Macs. Before we can answer that, it’s important to understand why this is an issue. The current cloud identity and access management (IAM) space has a very interesting dynamic. Historically, it has been dominated by Microsoft Active Directory® (AD), Windows-based systems, and IT resources on-prem. If you were to look back to the turn of the century, you would see that nearly everyone had a PC running Windows. They came to work each day, hardwired into the network, and authenticated against the on-prem AD domain controller living somewhere on-site. The result was a simple and secure IT infrastructure that was relatively easy to manage. Then, things started to change in the mid-2000’s. Application vendors started to shift their products to the cloud. Google had already gained immense traction with their search engine and seized an opportunity to provide a cloud based computing platform to compete with Microsoft solutions. Over the years they fine tuned their products to the point we are at today with the widespread implementations of G Suite and Google Cloud Platform. At the same time, Apple was building massive inroads into the Microsoft dominated PC market. 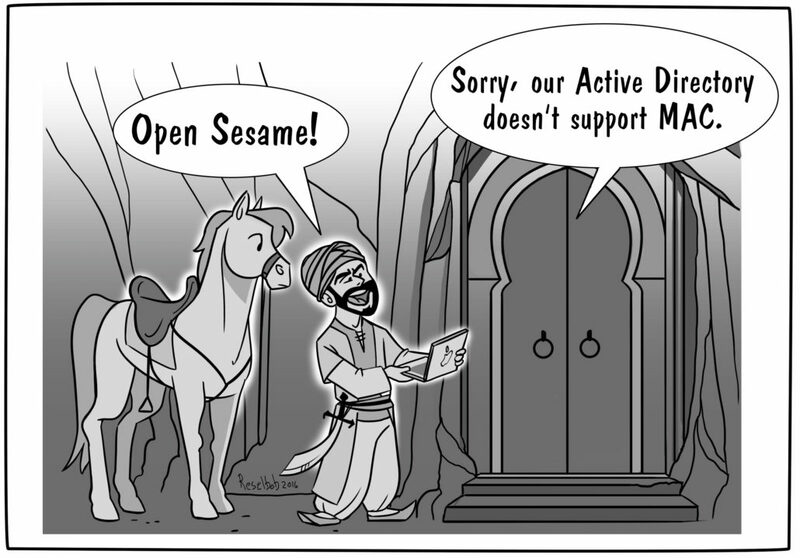 The trouble was (and still is) that it was difficult to extend Active Directory to Mac systems. Microsoft made sure of that by limiting AD’s capabilities for both user and device management for Mac systems compared to Windows endpoints. Nevertheless, Macs continued to gain popularity in the enterprise. Today, Macs are a common sight in the office. Not surprisingly, Microsoft is still resisting the rise of Apple in the enterprise, making it difficult for sysadmins at each turn. That is why it is not uncommon for Mac shops to leverage Google as an alternative to Microsoft solutions like Office 365, Azure, and AD. The trouble is Google Cloud Identity is only interested in managing their respective services, which brings us back to the original question of how to connect Google Cloud Identity with Macs. 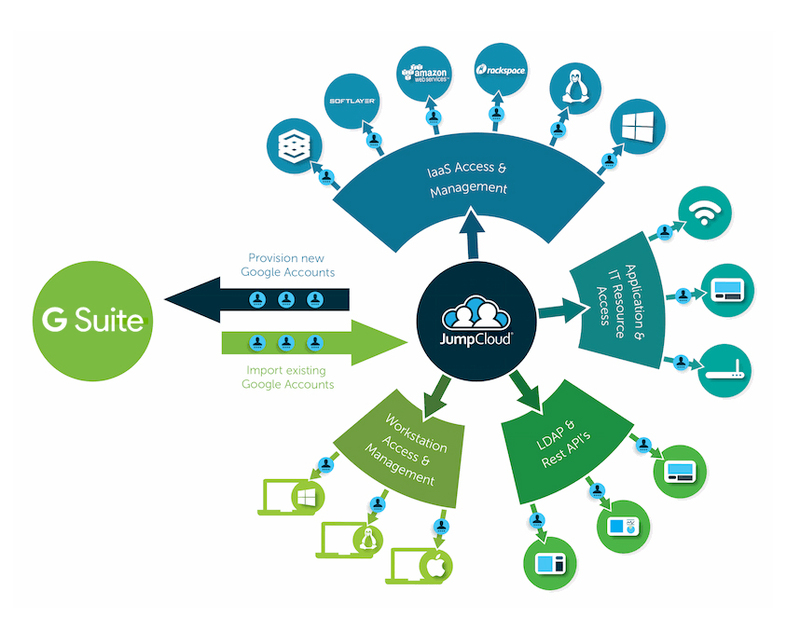 The solution is to leverage a complementary cloud identity management platform called Directory-as-a-Service® from JumpCloud. Directory-as-a-Service completes the circuit between Google Cloud Identity and Macs by allowing IT admins to leverage Google cloud identities to authenticate on Mac systems. It works by first installing a lightweight agent on your Mac endpoints. Then, admins can import Google Cloud Identities into the JumpCloud administrative console by leveraging JumpCloud’s G Suite Directory Sync feature. The result is that imported Google Cloud Identities can then be federated to Mac system endpoints for authentication and access management with the user’s Google credentials. The best part is that connecting Google Cloud Identity with Macs is only one aspect of the comprehensive management platform that Directory-as-a-Service has to offer. Directory-as-a-Service seamlessly integrates with Google cloud identities and federates those identities to a wide variety of IT resources including systems (Mac, Windows, Linux), cloud servers at AWS or Azure in addition to GCP, on-prem and web applications via SAML and LDAP, physical or virtual storage, and wired or WiFi networks through RADIUS. We invite you to click on any of the links above to better understand that component of JumpCloud’s platform. To learn more about how to connect a Google Cloud Identity with Macs, watch the video above or reach out to us directly. You can also sign up for a Directory-as-a-Service account and start connecting a Google Cloud Identity to all of your IT resources today. Your first ten users are free forever – so you can think of this as a test environment where you can demo our system and identity management capabilities.